Here we are, already two weeks into the new year! The ending of one year and the beginning of another is always a time of reflection and goal setting. As we continue to consider our 2017 travel year, we also have been looking back on our past experiences, and it’s safe to say that we have had our share of nail-biting travel experiences. Traveling is all about the adventure, right? While we both love to try some adrenaline filled things during our travels (jumping off waterfalls, anyone?!? ), that’s not the type of travel adventure this post is about. The following are highlights of our mishaps, mayhem, and more experienced during our travels that we are hoping not to repeat in 2017 (or ever)! Crash and Burn! On our very first trip together, before we were officially dating, we went on a quick little road trip to Denver. Since it is a long story, I will keep it short. On the way to Denver, we were rear-ended, but thankfully the damage was minimal. After all, it was a Monday and bad things only happen to me on Tuesdays. Jinx!! Because this was a super quick trip, we made our return trip the following day, on a Tuesday. At about 11:00pm in the middle of B.F.E., we met our match on the interstate in the form of a massive bull elk. Both the elk and the Camaro lost the battle that night. And, while my car may have crashed and burned, at least our relationship lasted! The Houston Dungeon! On one particularly poorly executed trip, we planned to stay overnight in Houston. Our flight into Houston arrived about 11:30pm which is apparently the time all the taxis stop waiting at the arrivals terminal (which makes perfect sense, right?). Instead, taxis are available at another terminal, which getting to involves walking over a mile in a sketchy underground tunnel with your luggage because at that time of night, the tram also shuts down. I should mention that by the time we found made it to the tunnel, it was 1:00am. This tunnel had dim lighting, no security, no cameras, and no real signs of life except for us, and one super creepy guy. We could not have been more thrilled than when we finally reached the other side of the tunnel! Weather Woes! It seems one of our travel opponents tends to be the weather! Our most common weather woe is winter storms which have shut down airports and closed roads. Additional weather woes have included flying to the Florida Keys when both Hurricane Isaac and Hurricane Matthew hit, and being in Antigua when Hurricane Gonzalo hit the island (the first hurricane to land there in 15 years)! I also had to tackle flying to Spain while Eyjafjallajökull, the volcano in Iceland, was erupting and disrupting air travel across Europe. Sick and Sicker! Each of us has experienced pretty severe food poisoning at one point or another during our travels. In Puerto Vallarta, my husband was so sick that the hotel staff thought we were fighting because he could barely left the hotel room. Being sick when you travel is awful. As for me, let’s just say I don’t know when I will be able to eat buffalo chicken wings again after my most recent experience with food poisoning from the Fort Lauderdale Airport. The Great Tequila Scam of 2015! On that same trip to Puerto Vallarta mentioned earlier, we packed a bag because we wanted some amazing tequila (remember Murphy’s Law here). When we arrived, we planned our activities and were assured we would go to the special tequila distillery on Friday. Thursday we got a phone call indicating that because it was a holiday, we could not go to the distillery tomorrow, but our booking agent, Antonio, could get us some of that tequila we wanted so badly. With doubt in our mind, we strolled from store to store on Friday trying to find the same tequila to no avail. By Saturday, we resigned to the fact that we were not going to get the tequila we wanted and headed to the airport. Upon pulling up at the departures terminal, we saw Antonio with the biggest grin on his face and four wrapped bottles in his arms. We selected the two bottles we wanted, and while we packed them away he slit open the other bottles to show us it was in fact tequila from the distillery we wanted. We were thrilled! Our flights home were filled with difficulties so we began to talk about how awful the whole trip had been, and we both ended up with a sinking feeling about the tequila. We grabbed our bags in Denver and while waiting for the hotel shuttle at 3:00am we opened the tequila. It was an cheap knock-off! Completely exhausted and mad, there was nothing left to do but sit on the floor and drink it at the airport. 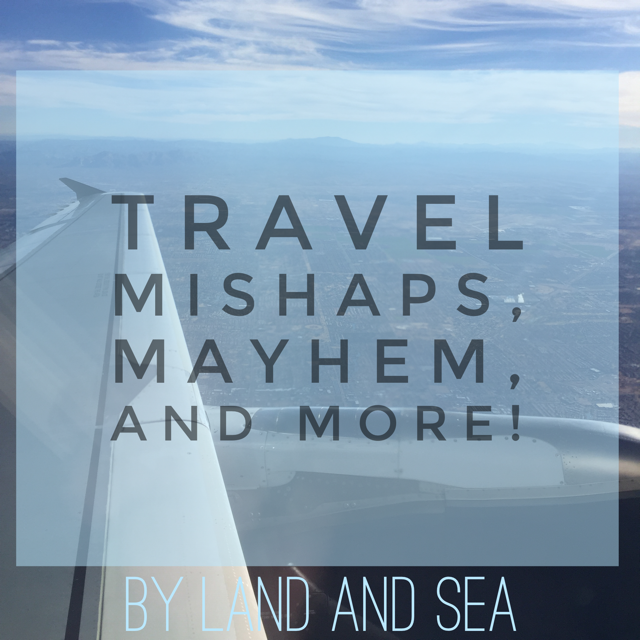 These stories are just some of the mishaps and mayhem we have encountered during our travels! What are your worst travel mishaps? Share them in the comments below! This post is shared on Feet Do Travel’s #FollowMeFriday travel community where bloggers share advice, stories, and pictures. Check out these great posts and don’t forget to comment – bloggers love comments and that’s how we build a community of like-minded travel lovers! Oh no! That tequila scam is terrible! It’s a horrible feeling to know that you were taking advantage of. And I agree that being food poisoned or having tummy issues while traveling is the WORST. It’s literally one of my worst fears, that I’d get problems on a long flight or bus ride, etc. Some of my worst mishaps were being robbed. In my first year of nomadic traveling, I managed to get 2 (kind of expensive) cameras stolen! I have that same fear on long flights! We travel with stomach medicine just in case and it helped me from getting sick on the flight from Ft. Lauderdale. I can’t imagine being robbed – how awful! No, travel certainly isn’t always glamorous like some people think! Yes, 2017 will be a much better travel year! Wow, you guys have been through a lot! I wouldn’t wish travel mishaps on my worst enemy, really, but at least it gives you some good stories to tell. Plus, you can eventually laugh about it (I know we do about ours). Here’s to a mishap-free 2017! Knock off tequila, that’s just cruel! Oh my goodness! You don’t read many stories like this about the other side of travel, which of course there is one! Fortunately we’ve not been sick whilst on holiday, we were convinced we were gonna get ill in Vietnam, its common there as food hygiene is not exactly great, but taking lots of precautions we were fine. Scam’s are the worst thing about travel! good to hear you’ve survived them! Really your post reminds me of a few friends that have had similar issues. Haven’t had too many mishaps myself but it’s all part of travel I guess. Scam on Tequila is just a sin! Glad you made the most it and ready to go for more adventures. Isn’t the tequila scam just rotten?! What a jerk! We gave him a good tip too! Happy 2017 travels to you too!!! I hate being sick away from home. I have a sensitive stomach so it doesn’t take much! That collision with the elk could have been a lot worse. Glad you guys weren’t injured! Oh that does make it hard I’m sure!! Yes, the wreck could have been worse. We were very lucky that night. I lived in Mexico City for 3 years, so it’s no surprise to me that you were cheated with the Tequila. I can imagine how friendly they were when they were handing you the Tequila. The reason for you not receiving your bags was a good one! I was once given a reason for my flight being delayed which was, ‘the reason the flight is delayed is because we don’t have a plane’ I think it was Cebu Pacific! Oh my goodness! I think I’ve heard that reason before too! I also like it when they “don’t have a pilot”!! Yeah, the tequila scam was a joke. It’s still tasty, but no where as good as the Baston Del Rey brand we were after! Great post guys! I don’t like it when my plane is delayed for mechanical reasons… that just scares the sh*t out of me! Like, just give us a new plane… no, no it’s all right a little gaffer tape and she’ll be as good as new! Never been to Denver but every time I hear the city mentioned I think of the film: Things to Do in Denver When You’re Dead. I’ve had a fair few travel mishaps over the years and they can be a pain. The Tequila scam sounds very annoying! We don’t check bags in fear that we will never see it again! The only real mishap was Tim getting food poisoning at the very end of our 6 month honeymoon! You would think it would happen within the first few meals in a new country but it happened in the 3rd week instead. Luckily he had plenty time to recover. Wow! You have definitely had some mishaps over the years. Lucky for me I have only been in one car crash and had a cyclone around! Eek! A cyclone sounds scary to me! I hope you can still look back and smile at some of these – they are great stories to tell friends and other travellers! I know what you mean about being sick though – I flew from Australia to the UK with food poisoning and it was one of the worst experiences I have ever had! Thank s for sharing and wishing you better luck for all future trips! Oh food poisoning on a flight is my worst nightmare! Yes it’s good to be able too look back and laugh… and write blog posts about them.